Debunking Christianity: Another God Before Us? Those who insist that there must have been a creator don’t get to arbitrarily decide the nature of the creator, based on cherished theological traditions. It just cannot be that the problematic god of the Bible is the only candidate for The Maker of the Cosmos. So it’s not all that radical to urge Christians to consider other gods that may have created the Cosmos. It’s a bit narrow-minded to be exclusive on this issue. For the sake of argument, perhaps we might consider that a god indeed may have kicked things off. 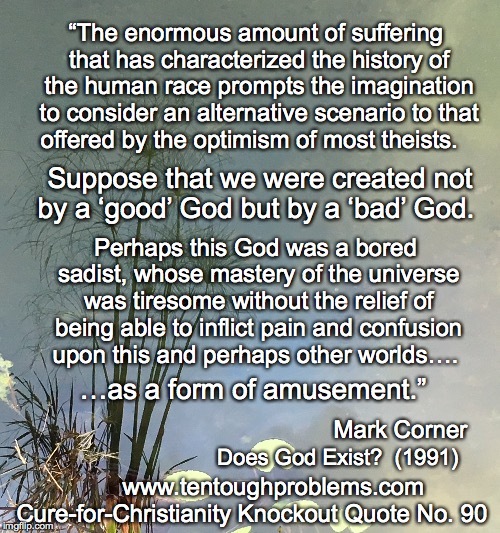 But, even so, we’d still have to be open-mindedness about what kind of god that was. While a good god is considered a self-evident truth by Christians, nothing about the Cosmos mandates this conclusion. Joseph Daleiden has observed that, given the state of the world, it would be easier to prove a Devil than a god. Is there anything that rules out an evil god as Creator? In fact—and how embarrassing is this for Christians?—many of them already believe in an evil god; those of the evangelical variety take Satan very seriously. As does Pope Francis, who employs a staff of exorcists. And Justice Scalia, good Catholic that he was, stingingly rebuked people who denied the reality of the devil. Jesus spoke of Satan (he even spoke to Satan), so what more could the Bible-believer want to prove Satan’s existence? Throughout Western history Christians have credited Satan with enormous havoc and evil, positioning him as their god’s adversary and as a cunning, irresistible tempter of humans. Christians may protest that Satan is not a god, but that’s splitting hairs. They’re convinced that Satan is a being who can stand up to and hold his own against their god. That is de facto acknowledgment that Satan has supernatural powers; he must enjoy some rank as a god. So why would it be such a stretch to believe that the chief god of the Cosmos is evil—perhaps none other than Satan himself? Or that the Satan who gets so much airtime in the New Testament is his deputy? 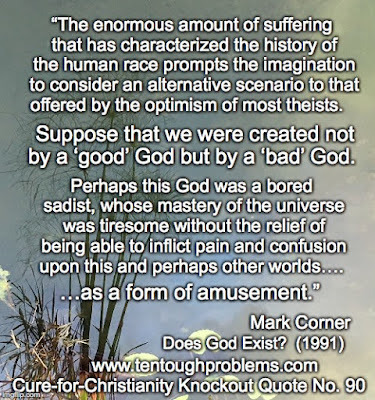 Frankly, the seriously defective god of the Bible would be a major disappointment as the Creator Deity. He is overtly and covertly evil, camouflaging his evil with talk of love. But an aggressively evil god would have to be a possibility. Joseph Daleiden, The Final Superstition: A Critical Evaluation of the Judeo-Christian Legacy (Prometheus Books, 1994), p. 136.